A Spanish fan watching a telecast of the game in Madrid can’t hide her disappointment. RIO DE JANEIRO — Defending champion Spain, the dominant global soccer power for the past six years, was eliminated from World Cup contention Wednesday with a 2-0 loss to Chile. Spain’s famed passing game failed against a high-tempo, tenacious Chile team, its era ending in the storied Maracana Stadium filled mostly with noisy Chilean supporters. Eduardo Vargas tricked goalkeeper Iker Casillas into diving the wrong way, then shot into an unguarded goal in the 20th minute. Charles Aranguiz scored in the 43d when the ball landed at his feet after Casillas punched out a free kick. ‘‘I only ask fans for forgiveness, we did everything we could,’’ said Casillas, who lifted the World Cup trophy four years ago. 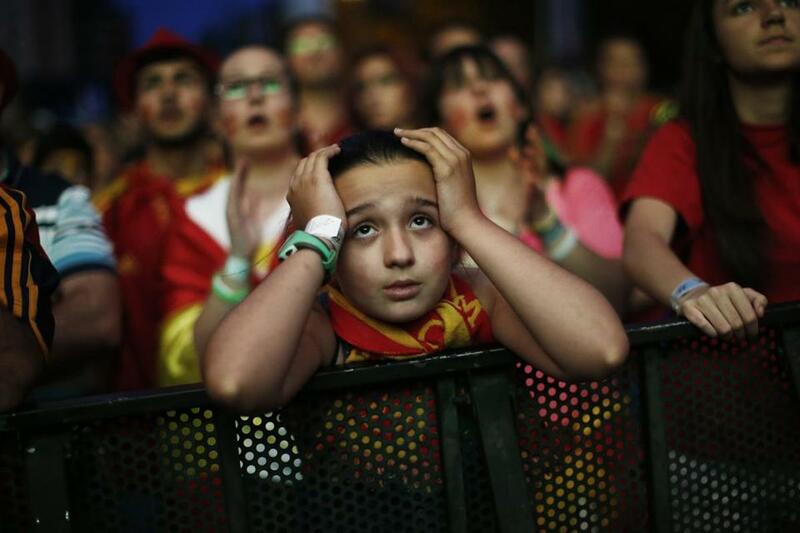 Spain’s second loss, after a 5-1 rout by the Netherlands, ended any hope of advancing. Chile and the Netherlands will both make it to the knockout stage regardless of who wins the game between them Monday, which will decide the Group B winner. Perhaps the Euro 2012 final was the footballing high point of the era: a 4-0 dismantling of Italy on a similarly balmy evening in Kiev, Ukraine. Spain came to Brazil with a team very similar to — but older than — the one that won those titles. They added Brazilian-born striker Diego Costa, but he failed to score a goal and was substituted in both matches. Spain’s ‘‘tiki-taka’’ style of play — keeping the ball for long stretches with short passes, and only shooting when you had a clear opening — had not been working as well in recent years. Brazil defeated Spain, 3-0, in last summer’s Confederations Cup, a warmup for the World Cup. The stars who had made the system go are still on the team, but they've clearly lost some speed and their connections haven’t been as sharp. Barcelona midfielder Xavi Hernandez, who often delivered the key pass, didn’t play Wednesday. But two pillars of Spain’s title runs, Hernandez and Barcelona teammate Gerard Pique, were left out, despite 194 combined appearances.